Forever Lost in Literature: Bodacious Creed and the Frisco Syndicate--Kickstarter Campaign! Bodacious Creed and the Frisco Syndicate--Kickstarter Campaign! Hello everyone! Today I am excited to share with you all a Kickstarter campaign for the sequel of Bodacious Creed, a book that I recently read, reviewed, and immensely enjoyed. 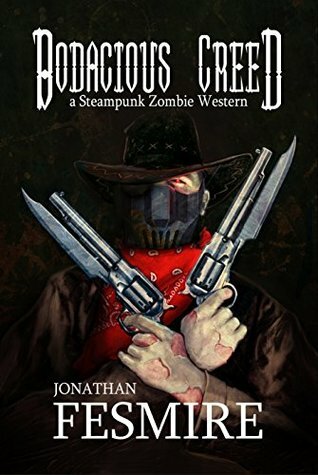 As you may or may not recall, Bodacious Creed is a steampunk zombie western that is every bit as adventurous and intriguing as it sounds. 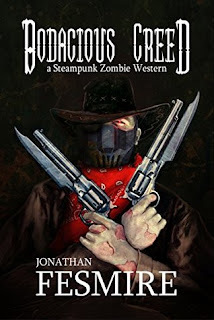 The author, Jonathan Fesmire, is currently working on the second novel in the series, Bodacious Creed and the Frisco Syndicate, and has recently launched a Kickstarter to help cover costs of creating the book, such as professional editing, cover art, and all those important elements that come with publishing your own novel! You can find all of the fine details over at the Kickstarter page, including a breakdown of the exact costs required and the research aspects that are required to write this series. The first book, Bodacious Creed, also found its success through Kickstarter! Sound interesting? Head on over and check it out! "U.S. Marshal James Creed has known loss, starting from the untimely death of his wife and daughter in a sudden fire. His work, chasing down and arresting outlaws across the Wild West, is all he has left to live for. Then one day, in 1876, the infamous killer Corwin Blake catches Creed by surprise and guns him down. Creed awakes after a mysterious young woman resurrects him in a basement laboratory beneath a brothel. Half alive, Creed feels torn between his need for justice and his desire to fall back into the peace of death. Creed's instincts drive him to protect the city of Santa Cruz, California, from the outlaws it harbors while searching for Blake. He uncovers a secret criminal organization, likely protecting Blake, determined to use resurrection technology for its own ends. The former marshal, now faster, stronger, and a more deadly shot than ever before, must work with a brothel madam, a bounty hunter, and the remaining marshals to uncover the criminal syndicate before they can misuse the machines of rebirth and create more mindless zombies. Meanwhile, he must also stop Blake, before the outlaw kills the only people he cares about. His own death can wait."